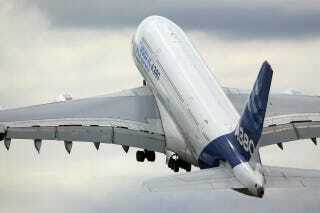 If there is a winner to be declared at an international air show, Airbus won this week's event at Farnborough. The manufacturer based in Toulouse, France racked up 496 aircraft orders, worth over $75 billion at list prices, against Boeing's $40 billion haul. On Monday morning, Airbus announced the offering of their much-anticipated A330 revamp, called the A330neo. The A330 has been in production since 1993, so it was about time for an overhaul. Rather than going with a clean-sheet design for an all new aircraft, Airbus opted for a new engine - the Rolls-Royce Trent 7000 along with redesigned wings and cabin. This saves billions of dollars (or Euros) in development costs, and also gets the product to the customer sooner. The A330neo promises a fourteen percent fuel savings, and is expected to be delivered to airlines beginning in Q4 of 2017. Boeing's 787-9 Dreamliner display made headlines as Boeing posted a video of the dress rehearsal, which now has nearly 2.1 million views. Some viewers were in such disbelief that they speculated the video was faked. Boeing flew the same demonstration at Farnborough, impressing crowds of avgeeks and dignitaries. In one part of the performance, the plane is brought down to perform a touch-and-go and then immediately pull away with a hard, banking turn. Officials were not pleased with the move, however, as Airbus was banned from executing a similar maneuver during their aerial display the following day. Qatar Airways grabbed attention by rejecting deliveries of their first three Airbus A380s, citing problems with the interior of the plane, including bubbled paint and mis-aligned flooring. Qatar's CEO Akbar Al Baker went over to Boeing the very next day and ordered fifty of Boeing's new 777X. FlightGlobal says a total of 1,210 planes were ordered at Farnborough, including 561 narrowbody, 275 widebody, 229 regional jets and 145 turboprops. This week's orders make this the most prolific Farnborough air show in history, though the 2013 Paris air show saw more orders. The most popular plane ordered was the Airbus A320neo, which scored 317 orders. Airbus' new A330neo got off to a good start, with 121 orders.